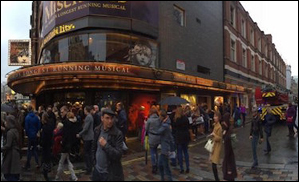 LONDON (VIP NEWS) — More than a thousand theatre-goers have been evacuated from one of London`s most popular West End musicals after a piece of electrical equipment overheated. The cast, who were performing a matinee of Les Miserables at the Queen`s Theatre in Shaftesbury Avenue, are believed to have been ousted from the theatre along with the 1,200 audience members as a precaution. London Fire Brigade said: "There has been no fire but a transformer in part of the theatre has overheated. "The auditorium itself has not been affected. "Two fire engines are on standby to oversee work by the UK Power Network. "Around 1,200 persons had already been evacuated as a precaution before the arrival of the crews." Audience members said on Twitter that they experienced a black out half-way through the show. The London production of Les Miserables is the world`s longest running musical where it played 7,602 performances at the Palace Theatre before transferring to the Queen`s Theatre where it opened in April 2004, according to the show`s website. This year it will celebrate its 30th anniversary in London.